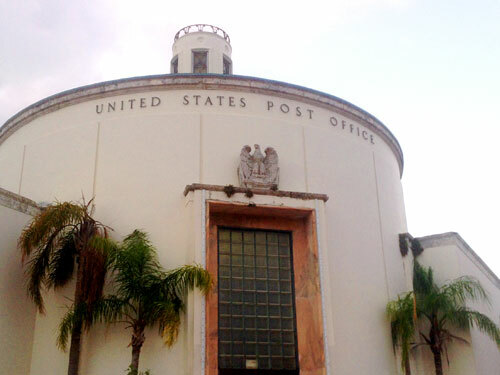 The streamlined Miami Beach Post Office was designed by Howard Lovewell Cheney and erected in 1937. It’s located at 1300 Washington Ave., pretty much in the heart of Art Deco Miami Beach, although I’d say this building is more Arte Moderne. What a year it’s been, filled with so many adventures! These are my favorite experiences of 2013, including some Cincinnati gems as well as public art and architecture elsewhere, plus some crazy nature to boot. There was a lot of Art Deco exploration this year, from Miami Beach to Rockefeller Center. When I choose content for this humble blog, I try to keep things really specific and wrap-your-mind-around-able: a building, a ghost sign, a single natural site, the work of one artist. The South Beach neighborhood of Miami Beach is filled with late Art Deco architecture and, although it’s expansive, it fits the bill for its over all architectural consistency. This terrazzo entryway proclaiming Cy Clyde is filthy and gross, but the jaunty type is really fun! I spotted this ghost sign in Miami Beach, in an entryway to a boutique. 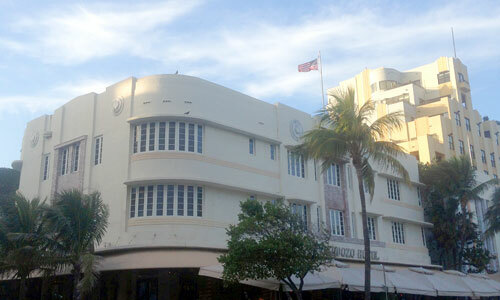 Surrounded by posh hotels, restaurants and boutiques, the Bancroft Hotel sits vacant at 1501 Collins Ave. in Miami Beach. The building is a fine example of the Streamlined, late Art Deco style, eschewing decoration for Machine Age modernity. Race St. Has a View: in downtown Cincinnati, the old skywalk to nowhere is now gone. The Benn Pitman House: a gorgeous Cincinnati home once owned by the founder of Phonetic Shorthand in the US and the first official stenographer for the US government, who built intricate furniture in his spare time. How to Grow Your Business through Holiday Gifts: kind words about our promotional seed bombs for TalentGrow. Decorated Houses Help Save a Detroit Neighborhood: Tyree Guyton’s Heidelberg Project gets some well-deserved love. There Is Now a Literal Map of Brooklyn’s Gentrification: just that. In posh and densely developed Miami Beach, it’s odd to encounter a lovely-looking hotel building that sits vacant. The former Peter Miller Hotel is located at 1900 Collins Ave.